Remember these dumbest moments? Here are some of the highlights of stupidity in 2003. The PC in the WC. 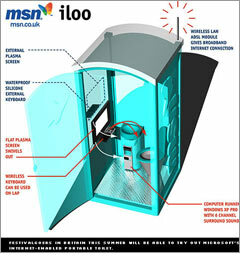 On April 30, Microsoft U.K. issues a press release touting a new product called the iLoo, an Internet-enabled toilet equipped with a Wi-Fi broadband connection, a plasma flat screen, a waterproof keyboard, and sponsored toilet paper festooned with Web addresses. According to the release, the iLoo will "allow instant logging on." Twelve days later, after much snickering in morning newspapers and on late-night talk shows, Microsoft flacks back in Redmond come up with a clever strategy for damage control. The iLoo, says spokeswoman Kathy Gill, was merely an "April Fool-like joke." The next day, realizing that nobody's buying the April-Fool's-joke-29-days-after-April-Fool's-Day explanation, Microsoft calls back reporters and admits that it had told an iLulu: The project was indeed real but has subsequently been killed. "We jumped the gun basically yesterday in confirming that it was a hoax," says MSN group product manager Lisa Gurry. "In fact, it was not."